The plant commonly called Soapwort or Bouncing Bet also bears other popular names, many of which are purely local. Some of these are hedge pink, bruisewort, sheepweed, old maid's pink, and Fuller's herb. It bears the name soapwort because of a substance called saponin which is a constituent of its roots and causes a foaming that appears like soap suds when the powdered root is shaken with water. Soapwort belongs to a large group of plants called the Caryophyllaceae, or pink family. In this family there are about fifteen hundred species. These are widely distributed, but are most abundant in the Northern Hemisphere, extending to the Arctic regions and to the tops of very high mountains. The popular and beautiful carnations and some of the most common plants that grow abundantly in waste places also belong to the pink family. 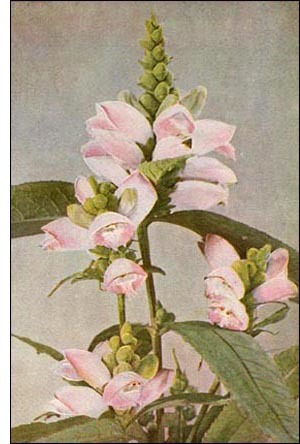 The soapwort comes to us from Europe, where, in some localities, it is a common wild flower. In this country, when it was first introduced, it was simply a pretty cultivated garden plant. However, it lives from year to year and spreads by means of underground stems. It was not very long before it had escaped from yards to roadsides, where frequently large patches may be seen. The flowers are large and quite showy. The color of the petals is usually pinkishwhite.